This hearty roasted potatoes with ham is an earthy, somewhat rustic dish, and a simple preparation. Slice, dice, toss, and bake! The easy oven dish is an excellent way to use leftover ham, and the dish makes a fabulous meal with a tossed salad. This is a great twist on everyday plain mashed potatoes. Cooked rutabagas are mashed with the potatoes, adding a subtle sweetness and lighter texture. Use garden fresh green beans or those delicious little French green beans in this creamed new potatoes with green beans recipe. New potatoes are seasonal, so if you can't find them, you can replace the new potatoes with small potatoes or fingerlings. These garlic mashed potatoes are easy to make and always a hit. This is our take on the classic Lancashire Hotpot. We added spicy andouille sausage to the dish, though a milder cooked sausage could be used as well. This hash brown casserole is packed with flavor, from the cheddar sour cream filling to the cheesy breadcrumb topping. If you take it to a potluck supper, make sure you take a few copies of the recipe. Who doesn't love basic baked potatoes? These potatoes are rubbed with olive oil and optional coarse salt and baked to perfection. Because of their high starch content and low moisture, russets are an excellent choice for baking. Whether for a big hearty breakfast, brunch, lunch, or dinner, you can't beat these great potatoes. 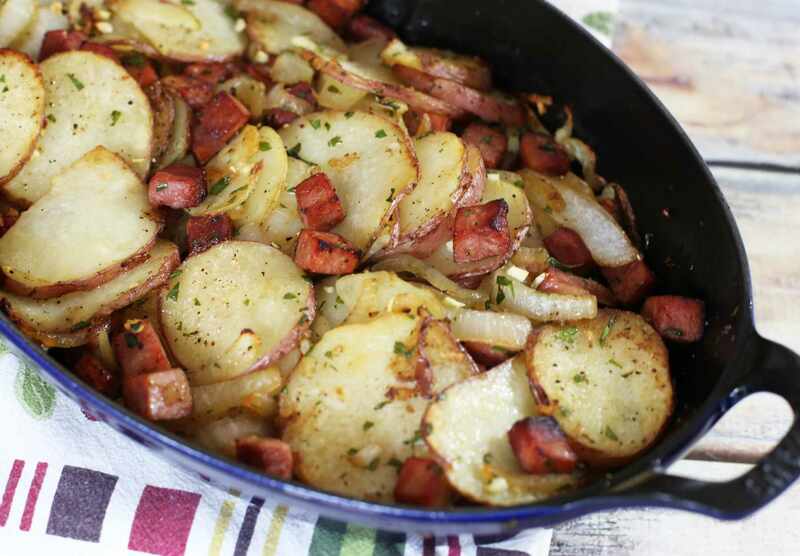 This version of skillet home fries is made with onions, but you can leave them out if you aren't a fan. Add some chopped bell pepper for color. These roasted potatoes are perfect for a hearty breakfast or brunch. They go well with steaks, roasts, chicken, or pork as well. This potato salad is an excellent salad to enjoy on a hot summer day or take to a cookout. There are eggs in this salad, but it could be made without them. The dressing is a delicious combination of mayonnaise and sour cream, with fresh dill and chopped dill pickle for extra flavor. This is a dish we enjoy with steaks or along with a beef or pork roast. The potatoes are baked, mashed, and then stuffed back into the potato skins. The filled potatoes are baked once again with a topping of shredded cheese, green onions, and crumbled bacon. Everyone loves scalloped potatoes, and the smoky bacon makes them that much more interesting. The creamy bacon and onion sauce is flavored with a touch of ground nutmeg. Feel free to omit the nutmeg and top the casserole with some cheddar cheese just before it comes out of the oven. This is a classic potato salad made with hard-boiled eggs and potatoes combined with a creamy mayonnaise and mustard dressing. We like to garnish this salad with sliced tomatoes and cucumbers when they're in season. Diced tomatoes team up with diced ham, cheddar cheese, and seasonings to make this delicious potato bake. The casserole is topped with buttery breadcrumbs for a crunchy, delicious browned topping. These roasted potatoes are just as delicious as the photo looks. The Parmesan cheese helps the potatoes brown, and it gives them an amazing flavor. It's a simple preparation, and the potatoes take about an hour to roast. Serve these crispy baked potato skins with a fresh chunky tomato salsa, ranch dressing dip, or plain sour cream. They make an outstanding snack or appetizer! These baked French fries are first tossed with a little oil. Use a spicy Cajun or Creole seasoning or use a seasoned salt blend. This awesome chunky potato and ham soup is full of flavor, and it is hearty enough to serve for dinner. Chunks of potatoes and ham float in a rich, cheesy base. Add a tossed salad and some crusty bread or biscuits for a meal your family will ask for again and again. This rich and creamy cheddar scalloped potatoes are always a hit. Bake this casserole for a family meal, holiday feast, or take it along to a potluck dinner. We were thinking of loaded potato soup when we made this mashed potato casserole. Sour cream, green onions, bacon, and cheddar are among the ingredients. It's an excellent casserole for a special occasion. New potatoes with garlic cream are small with very thin skins, and you'll only find them early in the growing season. They have a special creaminess and excellent flavor, but if you can't find them you can replace them with small round "baby" potatoes or fingerling potatoes. Preparation and cooking tips for perfect mashed potatoes, including how to choose the best potatoes for mashing, how to make them lump-free, and some flavor tricks. This baked potato salad is loaded with vegetables, cheese, bacon, and flavor! Serve it with burgers or steaks, or add it to your summer cookout menu. It's a great salad for tailgating, too! Out of Fresh Ideas for Beets? Take a Look at These Recipes!